Sandeep Chandi, Esq. 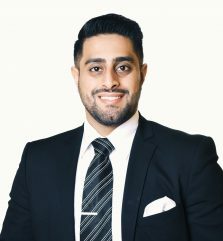 is an Associate Attorney with Pasricha & Patel, LLC with a primary focus in the business, commercial and technology spaces. With ample experience in a wide range of legal matters, his practice includes commercial transactions, commercial and residential real estate, as well as commercial and civil litigation. Sandeep’s client base has involved individuals as well as commercial entities including small businesses, start ups, institutions and corporations. He is a member of the New York bar.